Now that summer is close, we start looking for nice, cold and refreshing desserts. 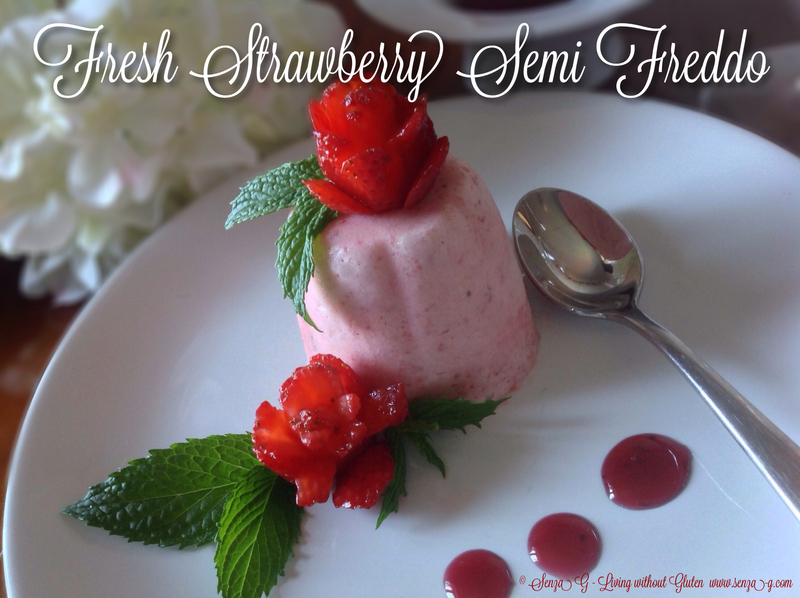 This semi freddo can also be made with frozen ones if fresh ones are unavailable. I would imagine this would be so delicious if made with fresh cherries too! The recipe below calls for shop bought meringues, unless you want to make them from scratch. Otherwise it is a very straightforward recipe! You can make them into small individual molds or else use a plum cake or loaf tin and serve sliced. Wash and hull the strawberries. Put them in a food processor or liquidizer and blitz into a puree. Crush the meringue, using the pulse action in your processor, so it will not end up as powder. Add to the pureed strawberries. Whip the cream and then fold the cream into the strawberry puree. Combine gently but well. Drizzle the liquor all around the molds you are using and then pour and fill up the molds with the strawberry mixture. Put in the freezer for at least 4 hours or overnight. When ready to serve, take out and leave for a few minutes before turning out on a dish or plates. Decorate with fresh strawberries and a few sprigs of mint.